We are celebrating June Dairy Month at the Janesville Farmers Market this month. Wisconsin’s dairy heritage is, of course, near and dear to my heart because I’m one of those lucky people who grew up in a dairy farming family. According to the Wisconsin Milk Marketing Board, as of 2011 Wisconsin had 12,100 dairy farms and 140 cheese plants. Our total cheese production for 2011 was 2,637,348,000 pounds, which was nearly a quarter of the total US production for that year. Cheese can enhance a meal or be part of a healthy snack that provides protein, fat, calcium and vitamins. Here in Wisconsin, we do love our cheese. We’ve even been known to wear its likeness on our heads. 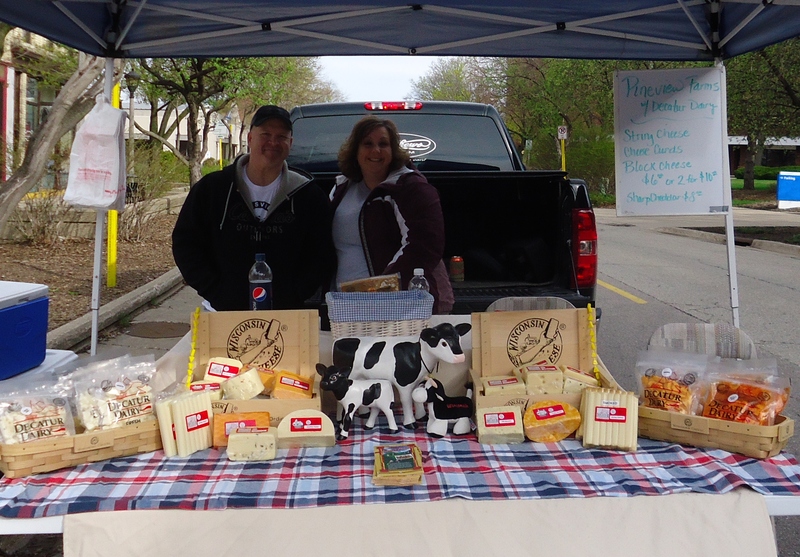 While you won’t catch me down at the market in a cheese-head hat, you may find me snacking on some locally grown and produced cheeses from Decatur Dairy/Pineview Farm, Misty Meadows (goat cheese) and Nina’s Dairy Goats/Farmer John’s Cheese. Did you know that both Colby and Brick cheeses were invented right here in Wisconsin? If you have never tried brick or colby, you are in for a treat. Try them in this omelette recipe or in your favorite grilled cheese sandwich. Try adding small amounts of greens or veggies to your grilled cheese. Here’s my favorite, which you can make right now with bread, greens and cheese from the farmers’ market. Arugula adds some spice to this dressed up grilled cheese sandwich. For a more mild sandwich, try spinach, kale or chard. Wash the arugula by swishing it around in cool water and rinsing. Dry with a towel or salad spinner. Coarsely chop the arugula and set aside. Have 1 – 2 tablespoons softened butter ready. (For extra pizazz, you may want to mix a clove of crushed garlic or some herbs into the butter.) Choose two slices of your favorite loaf of bread from the Janesville Farmers Market, such as Sourdough from Steiny Jo’s or Honey Wheat from Bridget’s Family Bakery or even Bacon Cheddar from Cakebox Bakery. Top one slice of bread with one slice of brick cheese. Sprinkle arugula on the cheese. Add a thin slice of tomato, if desired. Cover the arugula and optional tomato with the other slice of brick cheese and then the bread. Butter both sides of the bread in a thin layer. Put the sandwich on a cookie sheet and heat under the broiler, turning when the bread begins to brown. Cook through and enjoy. Put your sandwich carefully into your cast iron pan, frying pan or skillet. Turn the heat to medium low. You want it to be hot enough to melt the cheese before the bread becomes too dark. Flip the sandwich when the bread is beginning to brown and the cheese is starting to look soft. I like to put a pan lid on for a couple minutes to help the cheese to melt, but you have to be careful not to make your bread soggy.